We'll be pleased to welcome your visit to our warm and comfortable offices. 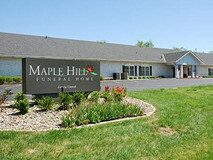 Maple Hill Funeral Home & Cemetery are designed to be unlike any cemetery you've ever seen; it's truly a one-of-a-kind place. ﻿Click here﻿ to tour this location.